Bring4th - Working with Nature (gardening, and woodwork). Bring4th > Bring4th Studies > Strictly Law of One Material > Working with Nature (gardening, and woodwork). Full Version: Working with Nature (gardening, and woodwork). it would come as no surprise that the 2d realm (and the 1d realm for that matter) is more 'alive', 'conscious', and 'responsive' than it is normally given credit for. after all the entire Creation is 'alive'. however, I've not done a lot of work directly with nature (getting one's hands dirty I guess), as I've been a city dweller for most of my adult life. Quote: 98.16 Ra: I am Ra. We view this appurtenance. It sings with joy. The pine vibrates in praise. Much investment of this working in wood has been done. It is acceptable. We may suggest it be left either as it is or rubbed with the oil which also is easily magnetized and holds the proffered vibration to a profound extent. Quote: 95.11 Ra: I am Ra. The dwelling seems surrounded with the trees and fields of your countryside. This is acceptable. We suggest the general principle of preparing each part of your environment as it best suits each in the group with the beauty which each may feel to be appropriate. There is much of blessing in the gardening and the care of surroundings, for when this is accomplished in love of the creation the second-density flowers, plants, and small animals are aware of this service and return it. I just spoke of a similar sending and receiving in another thread Nature certainly is healing, and I definitely feel love simply by being in it. Gardening is fun and you can learn a lot in a short period of time. I don't really work with wood much but there is a sense of purity when working with it, as the material is already formed..you just have to shape it. There's a sense of co-creation there, as it provides you with a fully formed base. You can feel that purity simply by whittling a stick. We always seem to be creating something with every act.."..it is our belief/feeling complex that the questioner shall shape this material in such a way that your mind/body/spirit complexes shall have entry to it, thus we answer your queries as they arise in your mind complex." We have a big garden and I spend a lot of time working in it. It's halfway between deeply satisfying and somewhat overwhelming because of all the things there always are that need to be done. I think Ra is probably right that the second-density creatures appreciate our work (especially, right now, whatever's eating our lily bulbs and our bean seedlings!). I love watching the butterflies flit around our butterfly weed, which is blooming right now. Glad to see you planted some asclepias..a native plant! Many people plant butterfly bushes because they love them for their nectar (which is great), but it has never been explained to most that the butterfly bush hosts zero butterfly larvae. The young won't feed on it. So if we want more butterflies, we have to make more butterflies as my one book says..asclepias being one of the best to plant. 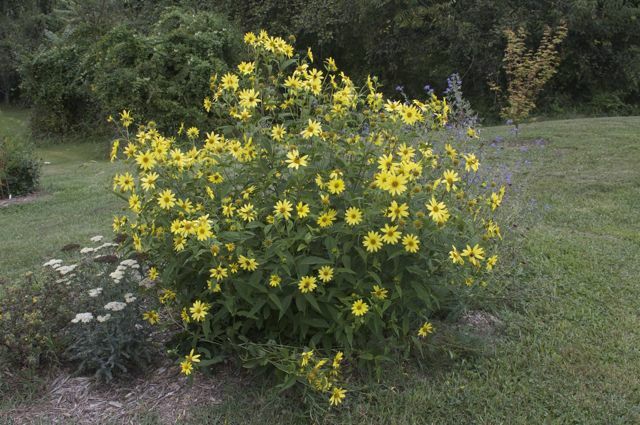 Growing native plants is one of the best things you can do for your local ecosystem. Yeah. Plus, asclepias is beautiful when flowering. I've been considering planting its sister milkweed, too, which is edible as well as also being a great native butterfly plant, but I'm a little leery since it is a colonizer and may spread into more of the garden than I want to give it. We grew prickly pear cactus for a while. That was fun and interesting! Asclepias is gorgeous for sure. I'm guessing you're referring to common milkweed? Around here it is pretty prevalent, so yeah, perhaps you could plant something else in its place. Even if it does spread though, it wouldn't be a nuisance to weed since its root system creates isolated plants. They'd be easy to pull. Attracting Native Pollinators is an excellent book. I wanted to plant this bushy lemon queen sunflower but I bought the wrong variety. There's a bushy variety and another type which has a main stalk with a large flower, then smaller ones branching off. I have prickly pear all over my back yard in places. Tons of it. Just grows naturally in Texas. Also get tons of sticker burrs. I hate when those ended up on our carpet inside, and got in our feet. That hurt. The dogs bring them in the house. We're tearing up our carpet, so this year we haven't had really any of them. I remember one got stuck in my heel pretty deep, and that hurt. I had my full weight on it when I stepped on it. Took a bit to pull it out of my foot. Regarding Milkweed, I heard that the sap was poisonous. Yeah, I'm thinking of Common Milkweed. You can eat it like asparagus (shoots), broccoli (flower buds), and okra (young seedpods). It's pretty, too, in its own way. Other types of asclepias, like butterfly weed, are toxic to humans. That looks like a nice sunflower! The tall ones are cool, too -- sometimes they get really tall. Gemini, do you eat the prickly pear fruits? The fleshy leaves are edible, too, but you have to watch the spines. The flowers are pretty, I think. I think I ate cactus from the store once before, but I think it was bland. I don't remember the taste. Yeah, you can buy prickly pear pads (nopales) in the Latino section of a lot of grocery stores. I bet they're common in Texas. I don't know if you can buy the fruits anywhere -- you have to be pretty quick to get them before the critters do. I have a fenced in yard, but I still see rabbits from time to time inside the back yard. I'm sure they'd eat the fruits. My dog loves to chase them, but never catches them in our woods. My dog has really good hearing. He once walked over to a spot and picked up a mouse and was eating it. He must have heard that mouse rustling in the ground, from like 30 feet away. Funny since he usually ignores me when I call his name. Does the prickly pear fruit have much flavor? Cactus fruit has a taste similar to raspberries or watermelon, with a slight bite like kiwi fruit. The fruit is filled with small seeds which make it grainy to the tongue. Yes, they're yummy. The description you found seems pretty good. Theyre tangy and sweet. I would say more like raspberry and kiwi than watermelon. Not worth the thorns when i can just eat a raspberry and kiwi. Ever have StarFruit? I barely remember what that's like. I don't remember thorns being a problem on the prickly pear fruits. Seems like the thorns were more on the leaves, and as long as you stayed clear of the leaves you were OK (kind of like picking blackberries or raspberries). I've seen starfruit but I'm not sure I've ever had them. Ever have durian fruit? I heard it smells awful. But nothing like Surströmming, which is rated as the worst smelling food. I never knew cacti produced fruit! Did you grow the prickly pear in the ground or in pots βαθμιαίος? In a garden bed. I can't remember for sure why we pulled them out. I think they got invaded by a weedy type of grass and it was really hard (and painful) to try to extricate the grass from the thorny prickly pears, so we ended up giving up on the idea. We had little kids at the time and neither they nor my wife were especially enamored of the cacti, although we all liked the flowers and fruits (when we could get them before the animals). I love gardening. But I don't do much of it because I feel immense responsibility for life under my care. But one of the most satisfying things is making something grow and bloom. I like to water ignored plants, mine or others, that seem to be desperate for water. I particularly enjoy occasionally salvaging pulled up weeds the landscapers who come my parent's house leave out to die. Don't get me wrong, I have no problems with killing or eating small plants, but in my free time sometimes I get joy out of replanting some larger weeds deep into the woods and making a little weed garden for all those left to die because of lack of time or care. There's probably some deeper psychological issues playing out about saving others I'm sure lol (the whole public defender thing etc etc). But a big part of it is just a joy in making things grow. (06-28-2014, 12:50 AM)xise Wrote: [ -> ] I particularly enjoy occasionally salvaging pulled up weeds the landscapers who come my parent's house leave out to die. Don't get me wrong, I have no problems with killing or eating small plants, but in my free time sometimes I get joy out of replanting some larger weeds deep into the woods and making a little weed garden for all those left to die because of lack of time or care. It surprised me when I realized how much killing (weeds, pests) was involved with gardening, which on the surface seems like such a life-affirming activity. Even thinning seedlings can be difficult emotionally -- it's very odd exercising the power to choose which plant thrives and which dies. It helps that we have a cow and chickens who are happy when I bring them the weeds, pests, and seedlings. I feel the same way..thinning isn't fun at all. I also hate when you're digging and you disrupt an ant colony. (06-28-2014, 07:38 AM)Icaro Wrote: [ -> ] I feel the same way..thinning isn't fun at all. I also hate when you're digging and you disrupt an ant colony. Good point. Around here, we have, among others, little black ants that are quite ferociously aggressive when their colonies are disrupted. I also hate cutting worms in half when digging, even though people say it doesn't kill them. Gardening -- not for the squeamish!